Line the bottom of an 8 inch square baking dish with parchment paper and then lightly spray with cooking spray. In a small saucepan, combine the cream, butter and salt to a boil and then remove from the heat. Set aside. In a medium saucepan, stir together the sugar, corn syrup and water over med-high heat. Bring to a boil while continuing to stir until all the sugar is dissolved. Continue to boil without stirring but swirling the pan gently until the mixture is a light golden color. Stir in the cream mixture slowly (the mixture will bubble violently) and simmer over low heat stirring frequently until the caramel reaches 248 degrees, or soft ball stage, on a candy thermometer, approximately 15 minutes. Pour the caramel into the prepared baking pan and cool completely. 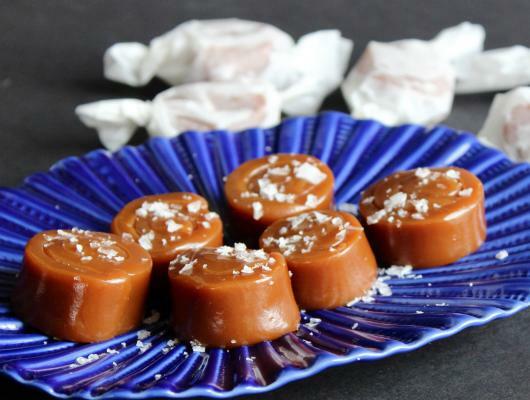 Cut the caramel into one inch squares and sprinkle the tops with sea salt flakes. 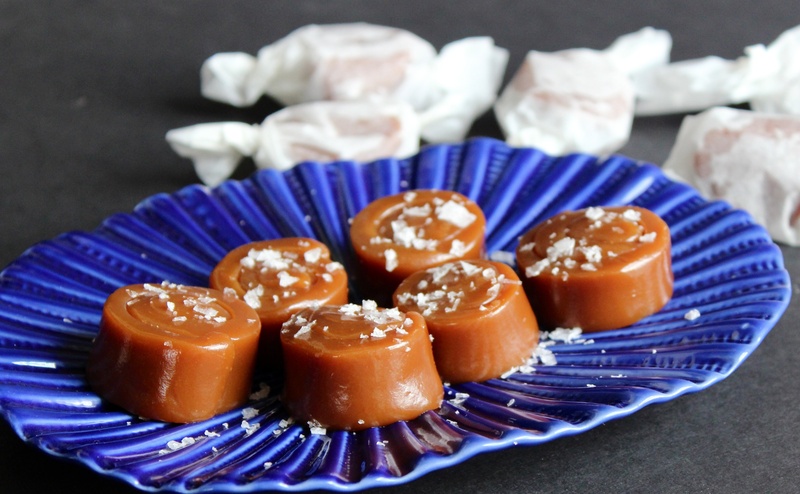 Wrap each caramel individually in a piece of waxed paper or parchment paper. *Note: I poured my mixture onto a baking sheet and cut the cooled caramel into 1/2 inch ribbons. I then rolled each ribbon into the pinwheel shape you see in my pictures. The squares are much easier because as you handle the caramel it will begin to warm up and become difficult to deal with. Traditional caramel, soft and sweet, with a sprinkling of sea salt. A surprisingly addictive combination.